Looking for a place to start fencing in CC as a forty year old beginner- any suggestion would be very appreciated. I have a club in Robstown, which is about a 20 minute drive from Corpus Christi and is the only one in the area. We are located at 415 E. Main. If you are coming in from Corpus on Agnes Street, you will turn right on highway 77. You will travel a couple of blocks and turn left at the car wash where you must cross under the highway. This is Main Street. You will continue down Main, passing up the Nueces County Library and Chevrolete dealer on the left. You will cross railroad tracks and continue traveling down Main Street. After a few blocks you will see an old theater building with a marqui shaped like a wave. This used to be the Gulf Theater; however it is now Coastal Gymnastics Academy. We have classes upstairs on Mondays and Thursdays. On both days from 6:00-7:30 we offer beginning foil classes. On Mondays from 7:30-9:00 we offer sabre lessons and open fencing, and on Thursdays from 7:30-9:00 my advanced kids get epee and sabre lessons. I have only been doing this since October, but it has really been successful. We have a great deal of fun and cater to all skill levels and ages. Just to give you an idea of how at least one of my students feels about fencing, I'll share an e-mail that I recieved last night about class. Note that she is 50+ years old.
" I LOVE FENCING. I REALLLLLLLLLLY ENJOYED TONIGHT. I was in a great mood till I got home and discovered one of the dogs had peed in the kitchen. 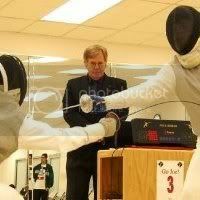 BUT, I love fencing.I'm on vacation next wk so would it be okay if I come Monday night. Is there anyone who fences foil on Monday nights?... I just think its dandy exercise. Plus it puts me in a better mood. I'm hoping to be able to do both M and Th night next wk if its (a) okay with you (b) it works out with my schedule...Did I tell you I'm trying to jump rope in the mornings before I go to work. A little jumping rope a little footwork. All to the good. Another good thing, tonight at HEB my bp was again normal. Yippee. I am so excited... thanks ever so much for letting me join your class. I LOVE IT. Time to put my USA fencing bumper sticker on my truck. cow a bun ga rocky." I will see you soon, I live in Rockport so it is a bit of a drive but it beats driving to Houston! Thanks again. Cool! We will see you then! I never met John, but things have been coming along quite well at CBFS. We now fence from 6-9 on Monday and Thursday nights. Newbies learn foil first, and we usually have enough experienced adults that walkins get one-on-one lessons. As new fencers become comfortable with foil, we have adults that can teach them sabre and epee. Incidentally, I now hold a Moniteur certification in foil and sabre and Lei Tan has his in sabre. We also have a wonderfully harmonious group that does all kinds of things to help out. This was probably obvious at our tournament, but they did not stop there! Lately, my fencers have been up to all kinds of mischief!! They created and installed racks for masks and weapons and purchased timing clips for weapons where we basically have three full electric strips. Additionally, one of my newest fencers is busy right now creating a new website for us, so my days of maintaing the website may be over. I have even been able to take off a few nights this summer. Imagine that? Just when I was almost overwhelmed, God sent help!!! Now we are looking at the possiblity of opening a second salle in Corpus Christi on Staples Street near Padre Staples Mall where Lei Tan is planning on opening a Kuman Learning Center, and we are hoping to hold a sabre clinic, possibly before the summer ends. I will let you guys know more as things develop. I am truly amazed that all of this has happened in less than two years. Things are really rockin' in the Corpus area, and I whole-heartedly thank everyone that has helped us get where we are right now!!! I truly believe only you could have pulled this off. I stand in awe. Thanks for the compliment and for your undying support! Is the word I hear correct? I got info you were going to close the Robstown salle and run the Corpus Christi salle as your main base of operations. Word is Wednesdays 7:00 - 10:00 P.M. at the Kuman Learning Center on South Staples Street. No offense to the other place, 'cause they gave you a start, but it's a lot nicer and the A.C. works! Sorry, Longblade. Now I have the time to address your comment in a little more detail. The Salle in Robstown was a great place to start up our club with lots of support and help from Phil Salazar at CGA. However, the Corpus Salle at Lei Tan's Kumon Learning Center held more promise because of the size of the city and the exact location. The facility is a bit smaller than CGA, but the AC is awsome and the construction is very new. I was really bogged down trying to teach fencing two nights a week in two different locations (especially being injured for about a month), so I discussed the issue with my fencers. My opinion was agreeable with everyone in the club, so now we are fencing one night a week in Corpus. Lei Tan has been a great help by offering us his place for a more than reasonable price. Additionally, right now I owe a lot to Tim Kellogg and Terry Groff. They covered classes for me while my leg was healing. Last night I officially returned to coaching. Man- it was GREAT to be back!!! Kumon lasted 10 entire days. Looks like we may be back in Robstown again. I'll let you guys know something real sson. I know Joe and I have spoke about coming to Chorpus and conducting a saber get together. We now have a really great coach at our club (Saber coach) that might be interested in helping out as well. Shoot me an email if you'd like to set something up. We are back in Robstown officially. Phil is a gracious man, indeed. We are fencing on Thursday nights from 7-10 p.m. at Coastal Gymnastics Academy at 415 E Main. Meanwhile, Phil has started lots of renovations. The place is really starting to look nice. I am thankful to have had the opportunity go down to fence with your dedicated little group of die-hards on Friday, Grace! (On an alternate day because of Thanksgiving.) I really needed to work off some of that turkey before it became a permanent part of me! Thanks! Best wishes Grace! Let us all know what we can do to help. Longblade, thanks for coming down and fencing sabre and epee with us. I got the ever loving snot whipped out of me since it was my first time back on a strip since my injury, but that is OK. Watch out... I'll be ready when you come back next time. Tim & Marty, I promise we will get something going when my personal life slows down a little bit. It really has been awful lately. Moving the salle to Corpus and back only complicated things, too. On top of that, this year I have been solely responsible for implementing a brand new reading program at my real job. So... I don't mean to put you guys off. I promise I'll holler when we are ready. Do not apologize!!!! Let us know when and where we can help. FYI- The phone number for Coastal Bend Fencing Society has changed to 361-438-7900. Hi. I have a 11 yr old daughter that is very interested in Fencing. We live in CC and I am having a hard time finding a place. Are yall still in Robstown? What nights/times etc. and what equipment does she need to have to come try it? She received her 1st degree black belt in Taekwondo in December and is looking to something in addition to Taekwondo now. Any information you can give me would be much appreciated. The Coastal Bend Fencing Society meets every Thursday, except on Thanksgiving Day and during the week or so of Summer Nationals or Junior Olympics, from 7:00 until 10:00 or 10:30 P.M.
Thursday practices are at 415 E. Main Street in Robstown at the Coastal Gymnastics/Cheer building (It was an old Movie Theater - Look for the Marquee). You can reach Grace (Saberbobcat) on her cell phone: 361/ 438-7900. Dress your daughter in warmup pants, a tee-shirt and tennis shoes. They will be able to outfit her with everything else she needs to try it out. Grace does not charge the first time or two to let kids find out if they like it and want to continue. There are a lot of kids near her age at CBFS so she'll have fun and won't be up against just big, hulking adults like me! Longblade always comes through for me. Thanks for answering when I was not able to do so immediately! Please feel free to come by and visit us. If you'll let me know when you are coming, I'll make sure the other kids are there that night. My e-mail is Saberbobcat@aol.com. Hey, LongBlade... you really are a great attorney! Thanks a bunch!! !